A basic understanding of Swift is needed to follow this tutorial. Augmented reality (AR) is all about modifying our perception of the real world. Information about our environment and surrounding objects can be overlaid to enhance your current perception of reality. This information can presented to the user in realtime, like in the case of a news feed in a live event. But the flow of information can also go the other way around. We can send the information resulting from the interaction with the augmented reality experience. 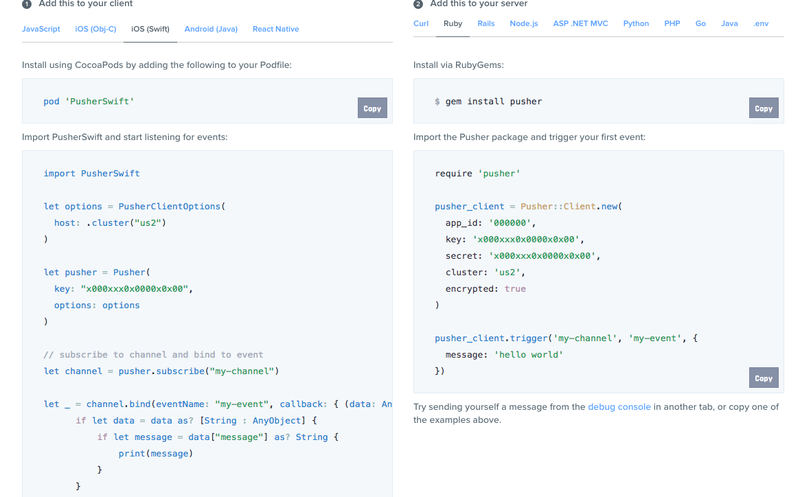 In both cases, Pusher can help you with sending and receiving data in realtime. One note of caution. The measurements are based on the plane detection’s capabilities of ARKit. They are not perfect in some situations, such as in low lighting or when a surface is not entirely flat. The results won’t be completely accurate all the time. They’re close, but they can vary. We choose this option because we are going to manually set up an AR view along with other controls. Now let’s start by building the user interface. Now add a text view. 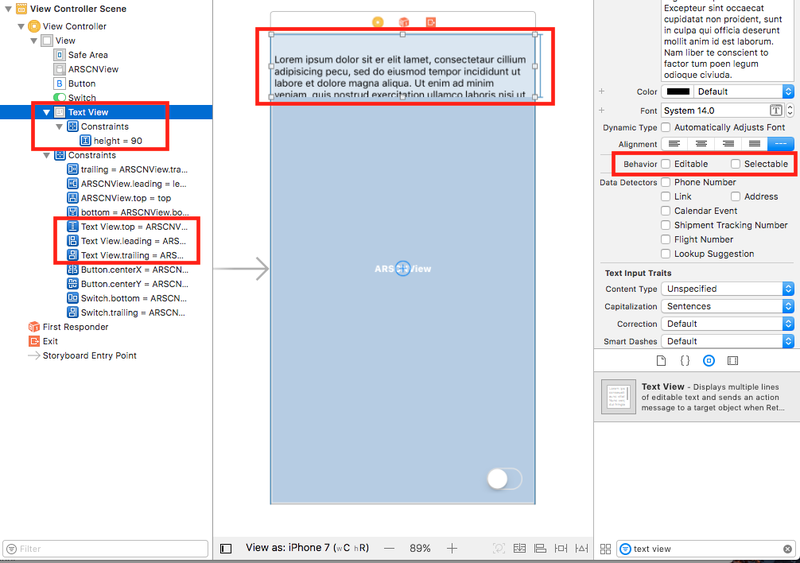 Disable its Editable and Selectable behaviors in the Attributes inspector. Change its background color. I chose a white color with 50% opacity. And now we’re ready to start coding the app. box represents the 3D box that is going to get drawn when measuring. We’ll review this class later on. For now, create it to eliminate the error. status is a text that tells us if the app is ready or not to take measurements (whether the app has detected planes or not). startPosition represents the measurement’s start position. distance is the calculated distance from the start to the current position (the measurement itself). trackingState holds the current tracking state of the camera. 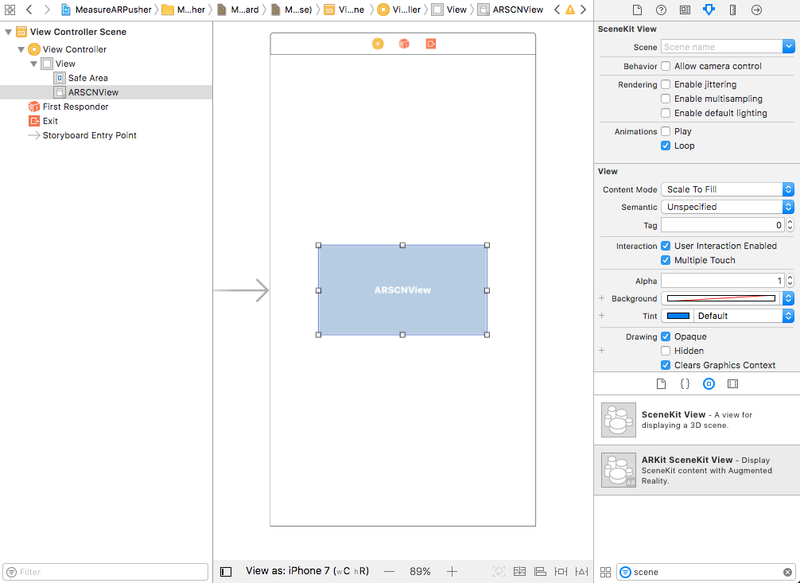 Mode is an enumeration to indicate the possible states of the app. 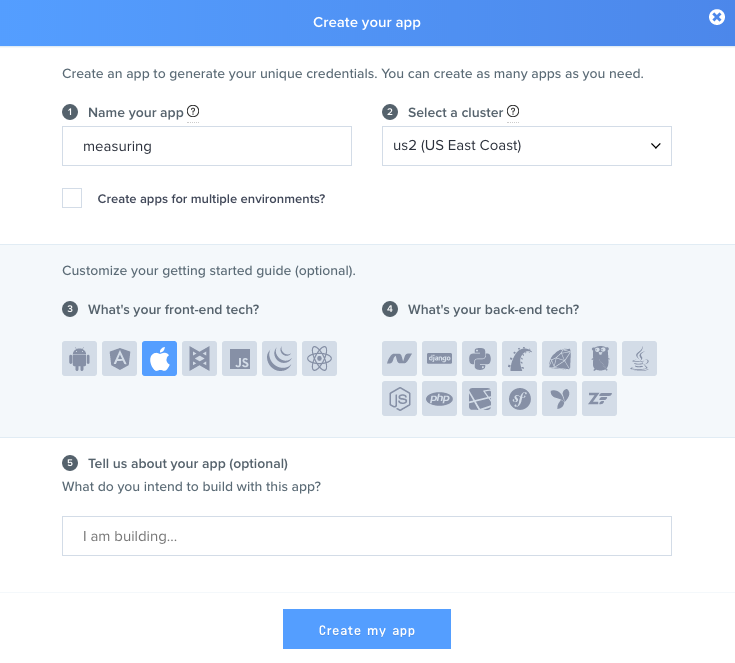 If waitingForMeasuring is set, we’ll assume that the app is not ready. Don’t worry, if it is, the status will change immediately. If the mode is set to measuring, we’ll reset the size of the box. We’ll review the method update later. We’ll show if the box is hidden, reset the startPosition and distance variables, and call the method that displays the value of those variables. var text = "Status: \(status! )\n"
text += "Distance: \(String(format:"%.2f cm", distance! * 100.0))"
"TRACKING LIMITED - Too much camera movement"
"TRACKING LIMITED - Not enough surface detail"
This method sets the text of the text view to the measure status of READY or NOT READY. 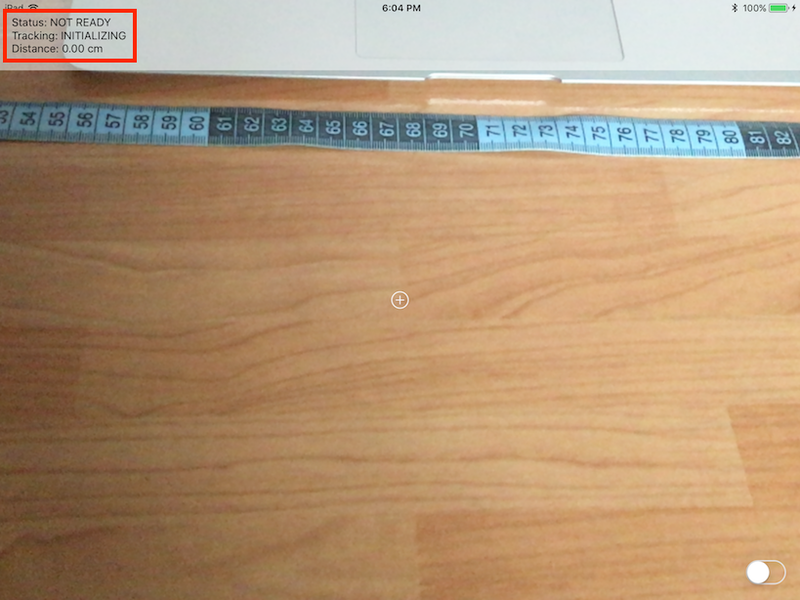 It shows a description of the tracking status of the AR camera with the help of the method getTrackingDescription(). And the (last) calculated distance in centimeters. Notice we have to multiply the value by 100.0. 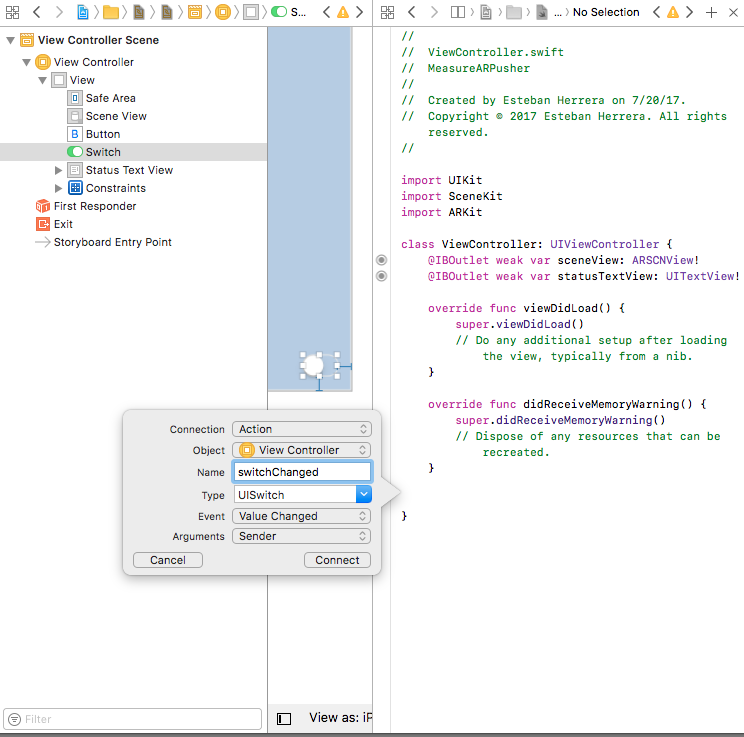 These methods are part of the callbacks that come with the protocol ARSCNViewDelegate. Now, here comes the interesting part. It’s called exactly once per frame, like 60 times per second. So we are going to call another method to use hit-testing to detect a plane we can interact with. When that happens, we’ll change the state from NOT READY to READY. The reference point will always be the center of the screen. That’s why we place that button with the plus sign. We’ll get the screen center coordinates to hit-test against an existing plane. If there’s a result, it means we can start measuring. featurePoints A point automatically identified by ARKit as part of a continuous surface, but without a corresponding anchor. estimatedHorizontalPlane A real-world planar surface detected by the search and without a corresponding anchor. The orientation is perpendicular to gravity. existingPlane A plane anchor already in the scene, without considering the plane’s size. existingPlaneUsingExtent A plane anchor already in the scene, respecting the plane’s limited size. The easiest option would be to use feature points. They represent notable features detected in the camera image. They are detected quicker than planes and there are more of them. But, this will give us very unstable results. Feature points are intermediate results of the scene analysis that ARKit uses to perform world tracking. So it’s recommended to do a hit test against existing plane anchors first. But the math is not done yet. We won’t be measuring straight lines all the time. To take measures in all directions and have the 3D box to follow, we need to take into account the rotation in the Y-axis. However, the atan2 function returns an angle from 0º to +/- 180º. Since we’re dealing with radians, we have to add the value of PI for normalization (PI in radians equals to 180º). Also, notice that the rotation property of the 3D box takes a vector of four elements. The three first components are the axis (we need to rotate on the Y-axis). The fourth one is the rotation in radians. In theory, we could use any primitive shape derived from SCNGeometry. But in practice, SCNBox is easier to use because we can define its X, Y, and Z-axis dimensions by setting its width, height, and length properties. In this case, we use small values so the box is shown with a good size. Also, notice we’re assigning a uniform white color to the box. You can use textures or configure the material in other ways to give it a more polished look. At this point, you’ll have a working AR measurement app. But let’s add the Pusher library to publish those measurements in realtime. Save your key, secret and cluster values, as we’ll need them later. What we are going to do is publish a client event to send the calculated measure in realtime. 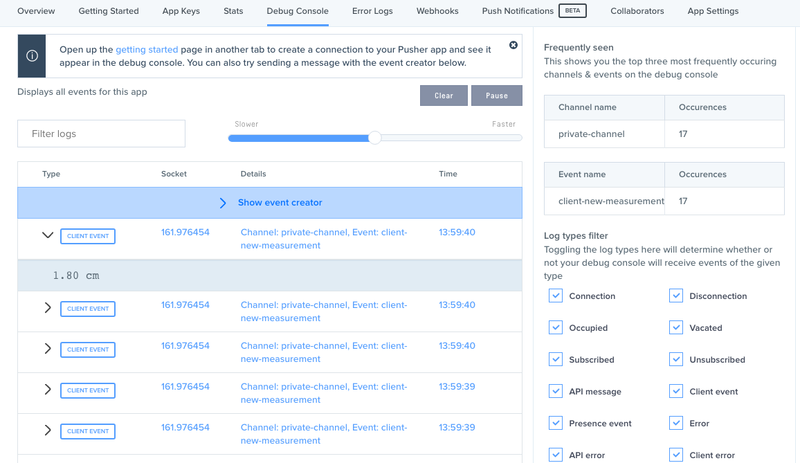 Events are the primary way of packaging messages in Pusher. Not all these events need to go to a web server for validation or persistence when using Pusher. Client events must be enabled for the application (like we did). The user must be subscribed to the channel that the event is being triggered on. Client events must be prefixed by client-. Don’t publish more than 10 messages per second per client (connection). Any events triggered above this rate limit will be rejected. endpoint(authEndpoint:String) The client will make a POST request to the endpoint you specify. authRequestBuilder(authRequestBuilder:AuthRequestBuilderProtocol) You specify an object that conforms to the AuthRequestBuilderProtocol. inline(secret:String) Your app’s secret so that authentication requests do not need to be made to your authentication endpoint. Instead subscriptions can be authenticated directly inside the library and used for development. 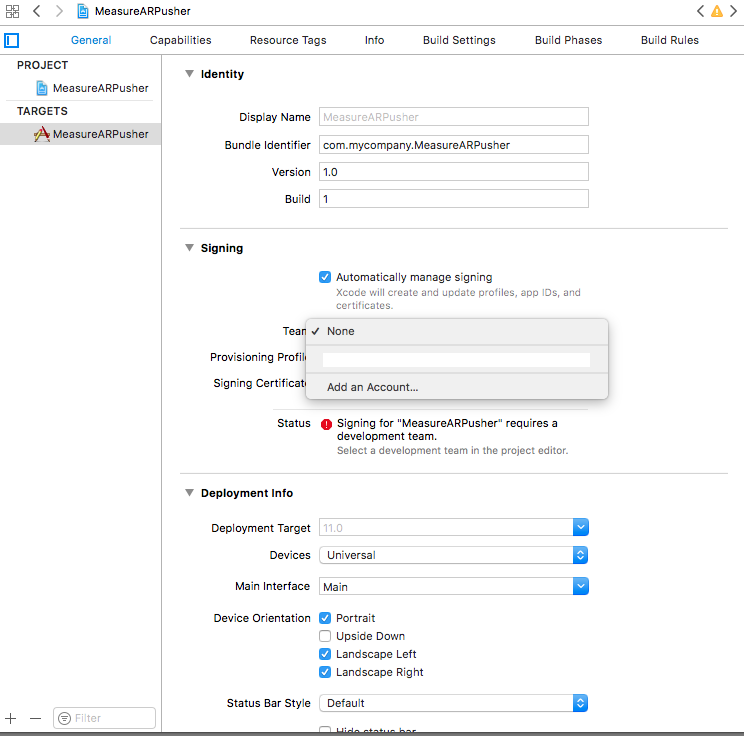 authorizer(authorizer:Authorizer) You specify an object that conforms to the Authorizer protocol to provide the appropriate auth information. noMethod If you do not need to set an authentication method, this is the default value. You can learn how to create an authentication endpoint on this page. 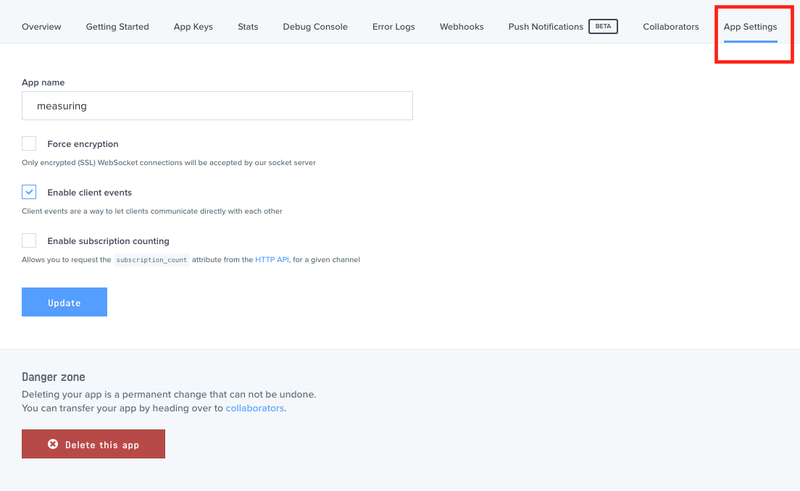 For simplicity, we are using the inline option that doesn’t require a server for authentication. Remember that the method renderer and the measure function is executed once per frame. Ideally, this is 60 times per second. To limit the number of client events sent to Pusher, we are going to use the TimeInterval parameter of the renderer method. This tells us the time at which the scene is updated. At first run, time will be greater than sendingTime. But then, we add 0.2 seconds (or 200 milliseconds) to time to set the new value of sendingTime. This way, we can be sure that the Pusher event will be executed at most 5 times per second. 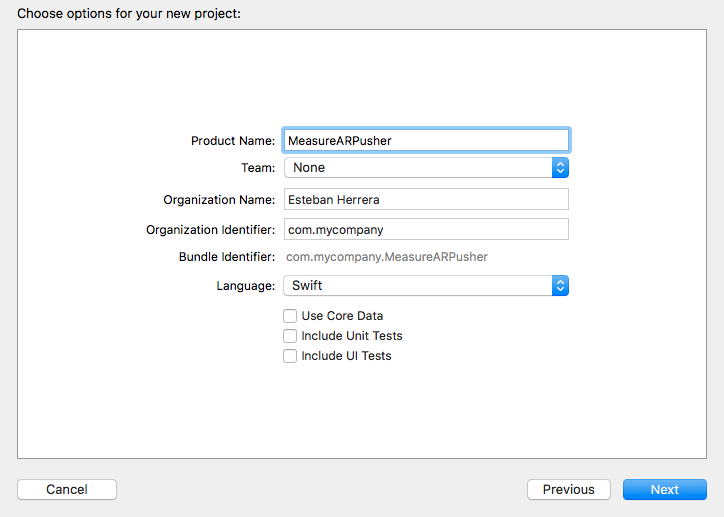 Of course, we could just send the last measure to Pusher to avoid the issue. But what will be the fun of sending only one value? It may take several seconds to initialize and find a plane so the status can change to READY, move around your device slowly and watch for the tracking state of the camera to speed up the process a little bit. 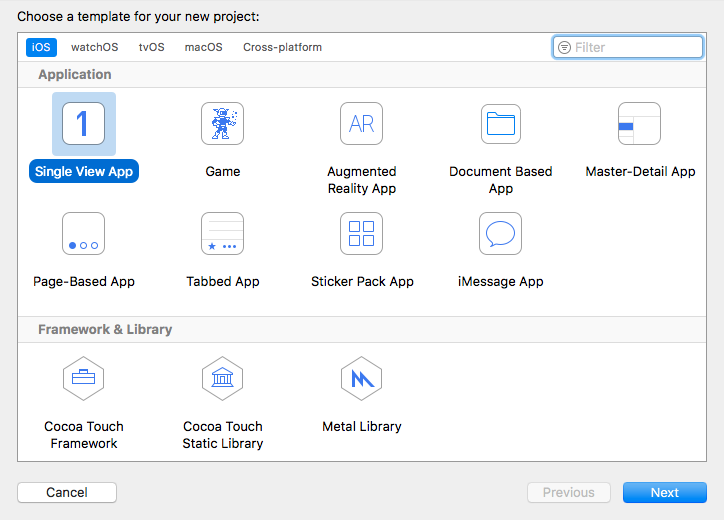 In this tutorial, you have learned how to create a basic measurement app with ARKit and how to use Pusher to send client events from an iOS app. Tracking the features of the real world is an important part of an augmented reality experience. However, sometimes the results are not accurate because the environment can be difficult to measure. 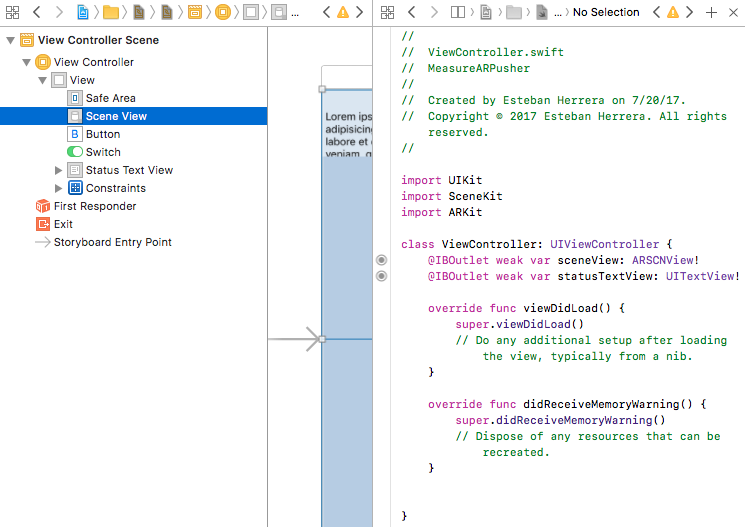 In the ARKit documentation, you can find some tips to improve the AR experience.